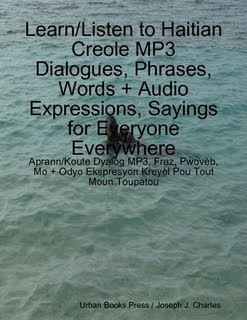 In this episode covering pages 44 - 52 of the ebook, "Learn/Listen to Haitian Creole MP3 Dialogues, Phrases, Words + Audio Expressions and Sayings for Everyone Everywhere,"you will learn about how to order your meals in a haitian restaurant, how to negotiate the price of your meals, how to ask for a correction of an error on the check or (fich in Creole. You will also learn about 'Love is in the air! the story of a handsome American doctor (Ben Cardozo) who fell in love / head over heels for a beautiful Haitian woman (Darline Byeneme, Bien-Aime) who became his Haitian culture and language teacher. You will also learn the love words to use when you are talking to your boyfriend or girlfriend. "Doudous mwen, cheri, kè-m, po je-m, chouboulout mwen, marabou mwen, mennaj mwen, myèl mwen(my honey), flè mwen, amou kè-m (the love of my heart), lanmou lavi-m (the love of my life), lavi-m (my life), syèl mwen (my sky), rèn lavi mwen (the queen of my life) are some of the endearing terms you can use to talk to your girlfriend. Just be creative and seize the moment!